Are you planning a holiday tour? Nepal could be your right destination. 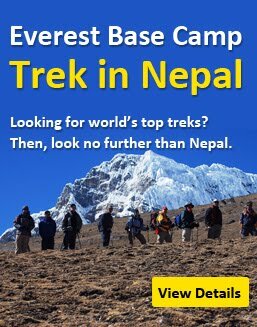 Being an exotic destination and dreamland for holiday makers, Nepal offers the best tour packages including trekking tours, adventure tour, cultural and historical sightseeing, helicopter tours, wildlife safari and bird watching, mountain biking, rafting, bungy jumping, boating and short hiking. You can enjoy the mysterious cultural and historical places, old monuments, temples, monasteries, green jungle, breathtaking Himalayas, fast flowing rivers and lakes, waterfalls, cities and villages. Kathmandu, patan, Bhaktapur, Nagarkot, Dhulikhel, Shivapuri, Namobuddha, Kirtipur, Pharping, Chandragiri, Kakani are some popular destinations in and around Kathmandu valley to enjoy the culture, festival, old places, art and architecture, pilgrimage shrines, greeneries and pristine Himalayas. Apart Kathmandu, pokhara, daman, gorkha, palpa, lumbini, chitwan national park, nawalparasi and bandipur are some other places not to miss. There are many hotels, resorts, restaurants ranging from budget to luxurious to facilate you for accommodation and food during your holidays. Most of these tour places are accessible on vehicle. But when you go high to the Himalayas for trekking tours, you need to walk 4-8 hours a day with a backpack walking on mountain road.